Food is something that we place on our mouths to munch on every day. They keep us fueled for our everyday activities and these also give us the nutrition we need. Food comes in different types and each of them has varying tastes, colors, textures, sizes and shapes. Well, as you can see, food looks interesting that is why creative people make some interesting artworks from them. You can see that through creative plating, Bento boxes and other food presentations. But there is still a bigger scene that can be created with food that is way beyond the curves of a plate. It can form landscapes. 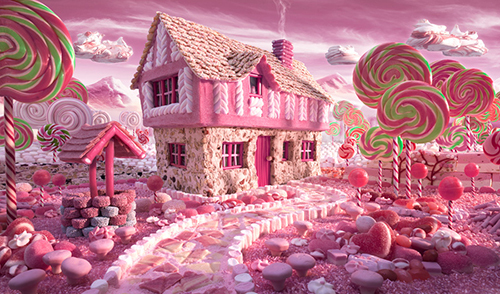 A London-based photographer makes foodscapes. 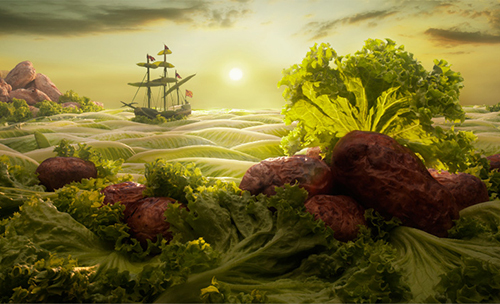 Yes, these are landscapes made from food. It is indeed very creative on how he chooses the food to use and how he sets them up on a large table. The detail on every foodscape he creates is applauding. 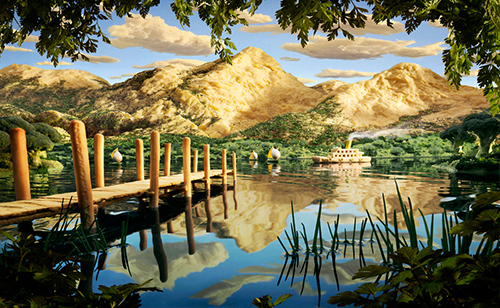 Aside from the good detailing, he also makes sure that they are of proper scale and that they have a perfect resemblance to real landscapes. 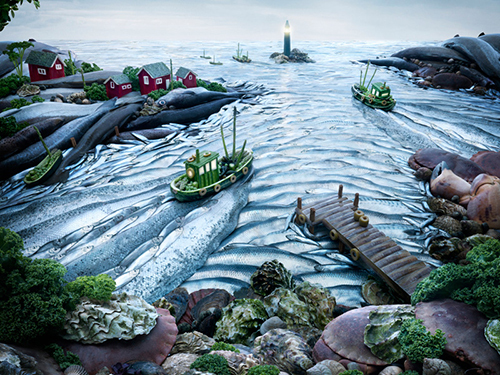 This foodscape artist is Carl Warner. 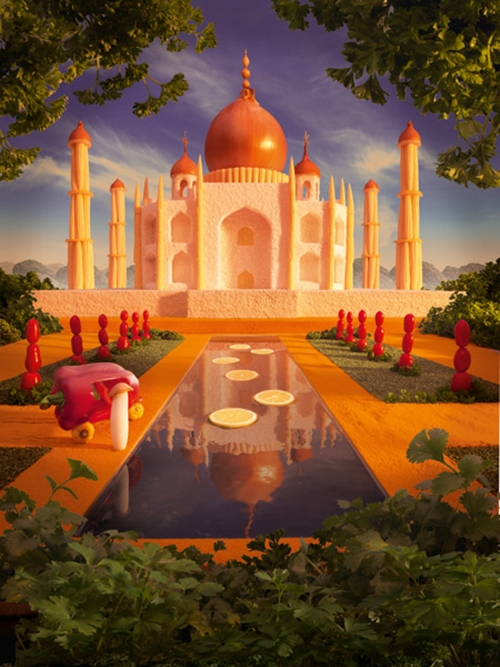 Carl Warner started his career as a photographer even if he aimed to be an illustrator at first. But since he finds photography faster and easier, he focused more on it. After learning the ropes of photography as an assistant photographer, he established his own studio and worked on advertising, landscapes and people. But then he thought of doing something unique to rekindle his interest in photography and to bring in more clients for his business. 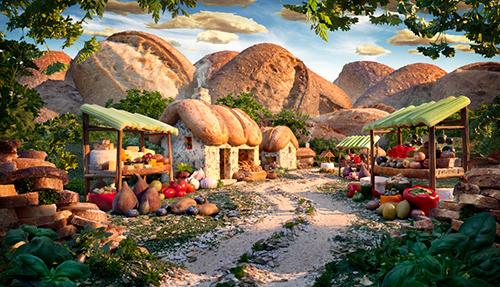 Foodscapes was born when Warner went to a food market and saw some portabello mushrooms. He thought that the mushrooms looked like trees from an alien world. He bought the mushrooms together with some rice seeds and beans. From that, he created his first foodscape called Mushroom Savanna. From then on, he made different foodscapes. Sometimes he would even need the help of food stylists to create the designs he wanted. He would start with a sketch and then they will work together to come up with the image. Proper lighting is always observed to make them look realistic. 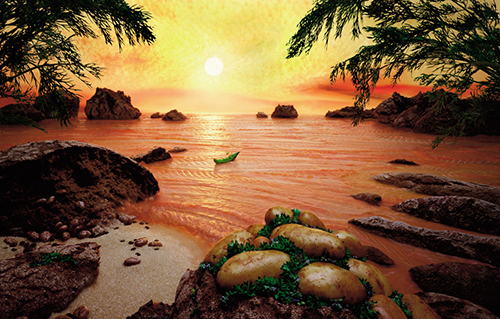 Now let us take a look at what Carl Warner came up with his Foodscapes. Isn’t this a lovely scene? The lettuce leaves as the ocean looks fantastic as well as the details on the area which looked like a food market. Well, if you’ll live in a village filled with bread like this one, you will never go hungry! This cottage reminds me of the witch’s home in Hansel and Gretel. The colors are indeed sweet! The island with pineapples is already a lovely creation but the coral like set up below is even more dashing. Love chocolates? 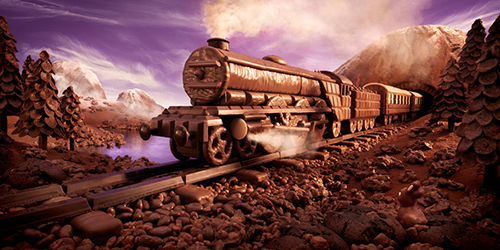 Then you will love this train made from chocolate! Everything you see from the railroad to the trees is all chocolate. Nom nom nom! What a serene scene this is. 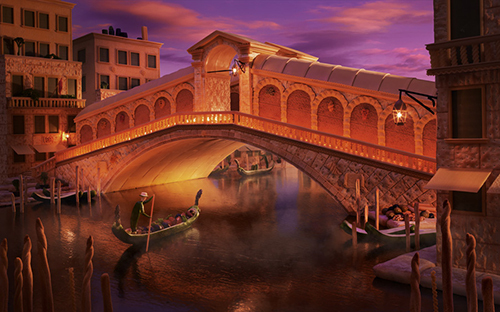 It’s like a place where you will be able to spend time alone to ponder on just anything while sitting on bridge made from crackers and breadsticks. It would take time to debone a salmon and lay them all on a large table to appear like the sea. The sunset looks stunning! To Paris with love! 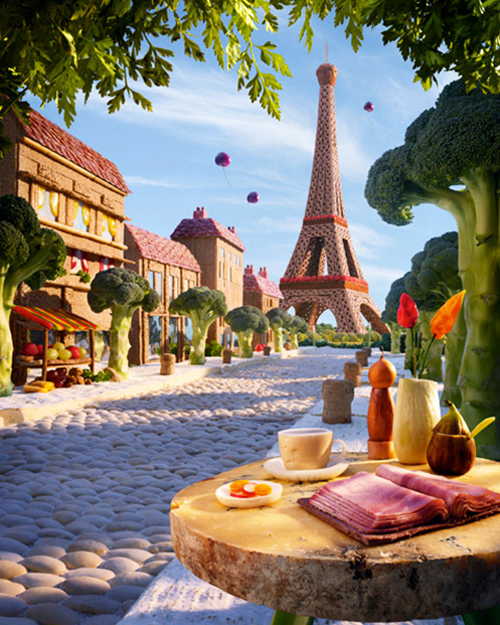 A miniature foodscape of Eiffel tower which is meticulously done. 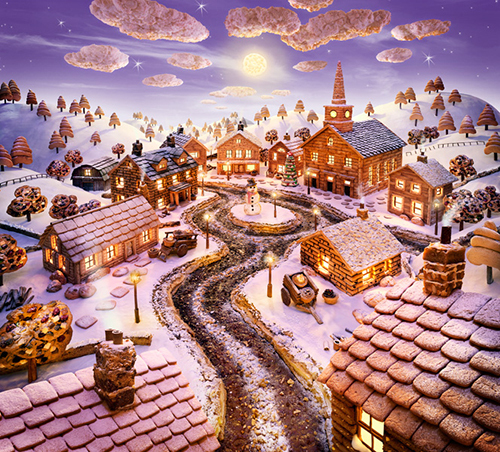 A yummy looking village where the homes are made with good detailing. Can you just imagine the time they spent in making this one? Taj Mahal is a favorite when comes to photography because of its beautiful design. Not to mention its rich history. 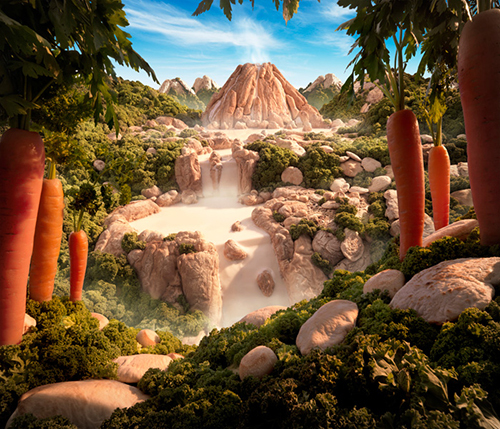 Warner also created his foodscape version of it. 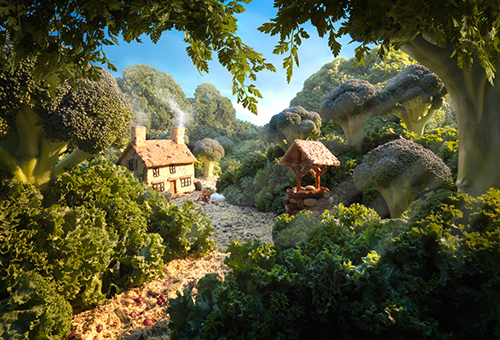 Broccoli trees surround this silent dwelling in the heart of lush green trees. We love the lighting that looked like an early morning setting. Even the smoke from the chimney looks so real. Another lovely setup of a hilly rural area with fields and trees around. The onions here are actually cargos for the cart. 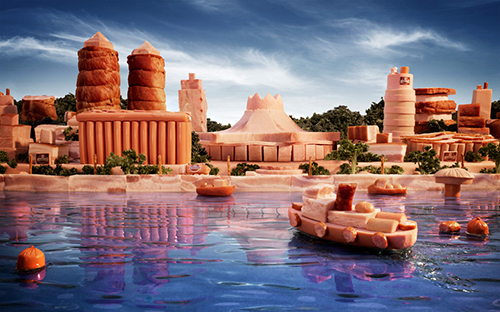 A cityscape of Ukraine using hotdogs, bacons and meat. One look at this one will actually make you think that it is a real painting because of the look of the buildings and the bridge itself. 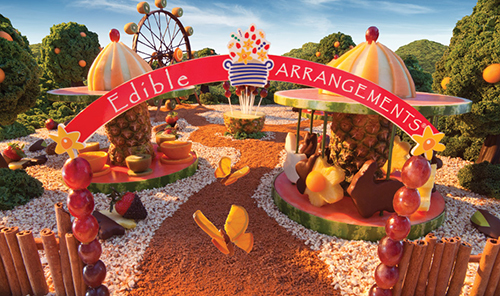 But once you see the pea boat, you’ll realize it is Warner’s foodscape! A sea of fishes! Look at all those scales on it. Little boats were made from cucumber. 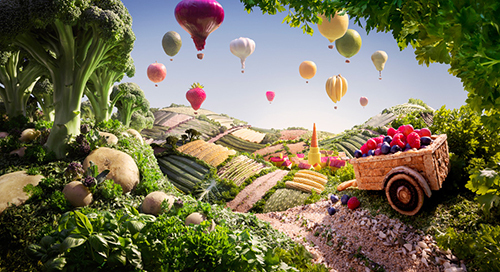 This is a lovely scene with onions and other fruits and vegetables that were made to look like hot air balloons. 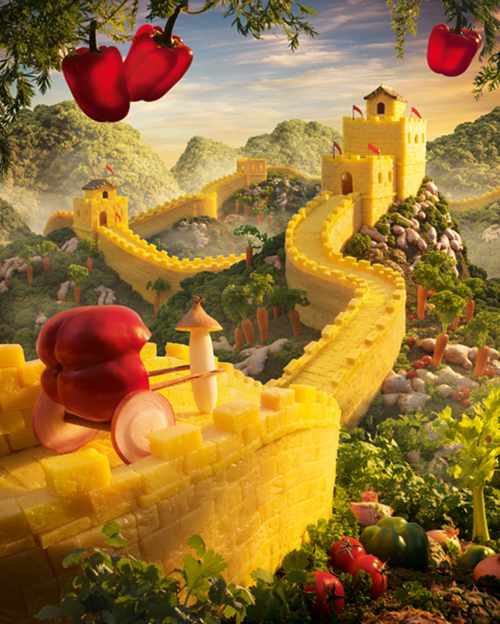 China’s Great Wall was made into a foodscape using lots and lots of pineapples! 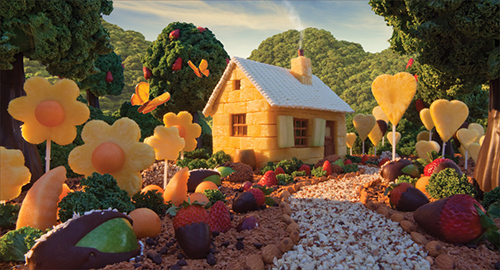 What a cute cottage with yummy fruits all around it created into flowers and stone-like figures. If only a real volcano could give off melting cheese like this, everyone would rush to get a dip!. A miniature of an amusement park with merry-go-round and Ferris wheel made from sweets and fruits. 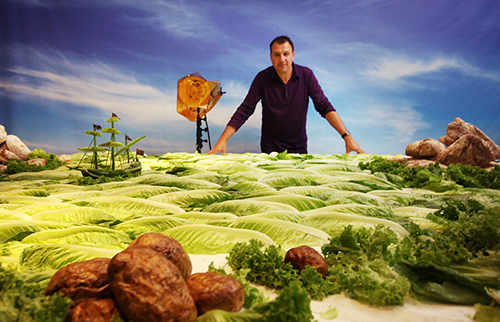 A beautiful scene of greens made from lettuce. This is the output of the first image you have seen above with Warner on the picture. We love the detailing of this. 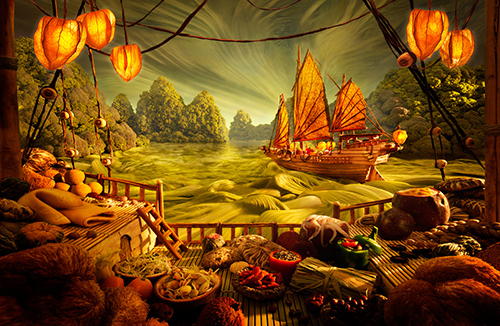 Can you spot the different fruits and other food elements used here? 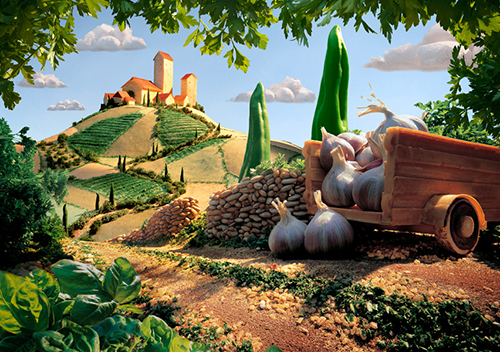 With the brilliant work of Carl Warner, his Foodscapes had captured the hearts of the people around the globe. This greatly helped him with his photography business. 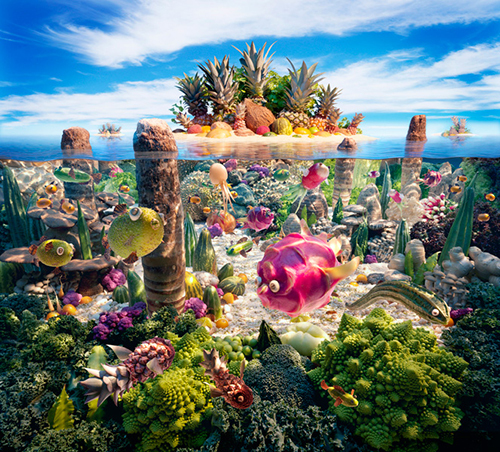 As a matter of fact, he was able to create a book called “Carl Warner’s Food Landscapes” and “A World of Food. You can see more of Warner’s works in his website. He also has a new series of photography work called Bodyscapes where he used bodies instead of food to create landscapes.